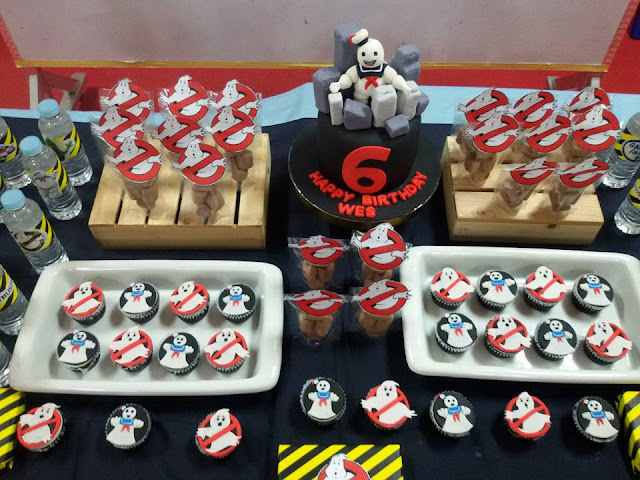 It's been more than a month since we celebrated my preschooler's birthday in school which means this post is overdue. But who gave me a deadline anyway? Wala naman, haha! Anyway, I just want to share with you my labor of love for my preschooler. It's a simple school celebration of his 6th birthday where most of the elements were DIY by me. I find joy in seeing that I made something out of nothing. In addition to that, the spark in the eyes of my son in amazement at the DIY projects I finished for him is priceless. 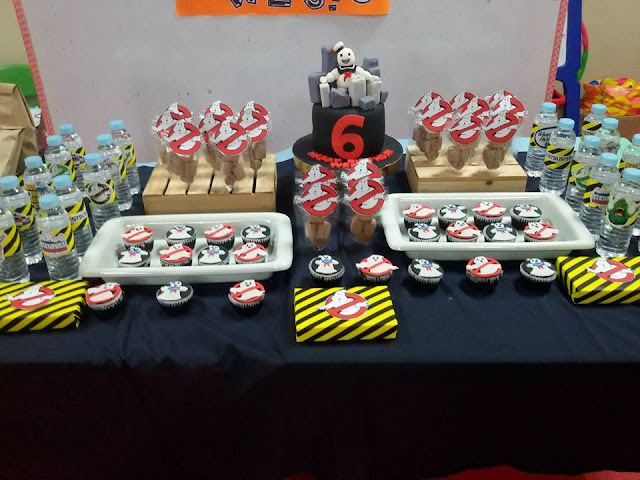 It also feels good when I saw how proud he was that his mom made his dessert table during his school party. 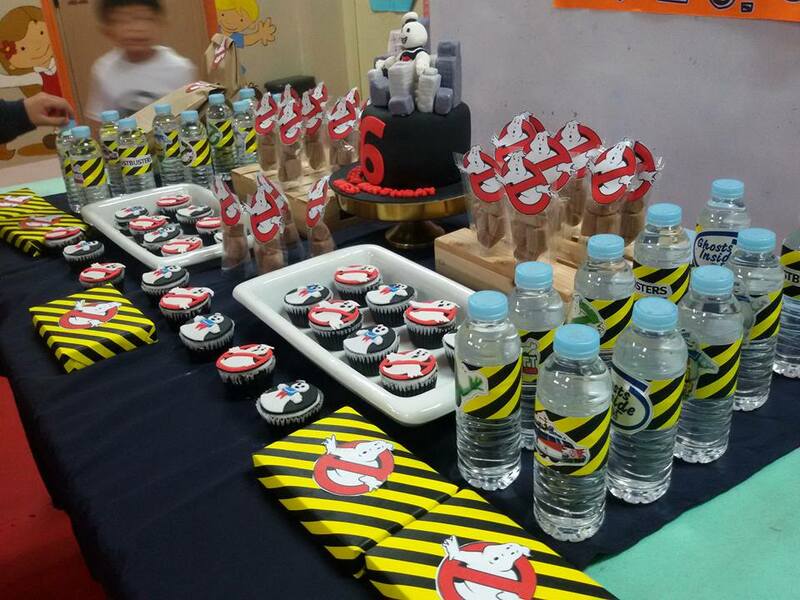 All his classmates marveled at the themed sweet treats and my son felt how special that day was, indeed a happy birthday. 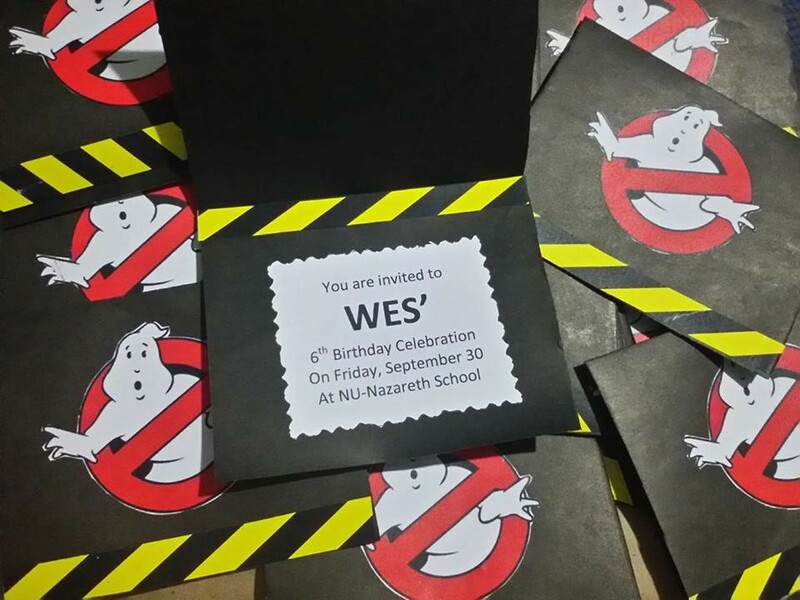 Materials used were bond papers where I printed the Ghostbusters logo, the text, and the caution (yellow and black pattern), black cartolina, scissors, and glue. Got my design inspirations from Pinterest and the rest the final output naman was all mine. 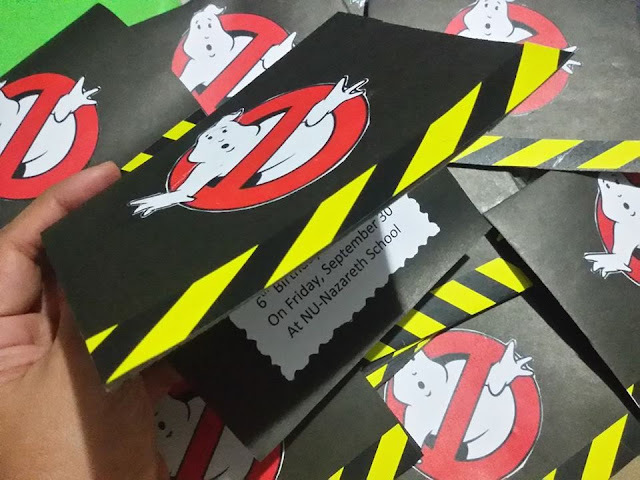 Materials used were of course bottled distilled water from the grocery, bond paper for the print outs, scissors for manually die-cutting the designs, and double-sided tape. 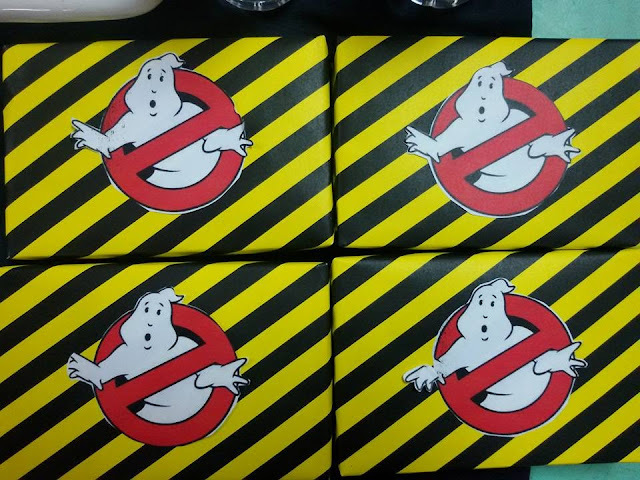 I removed the water bottles' brand wrap to replace it with these themed Ghostbuster paper wraps. Wait what? 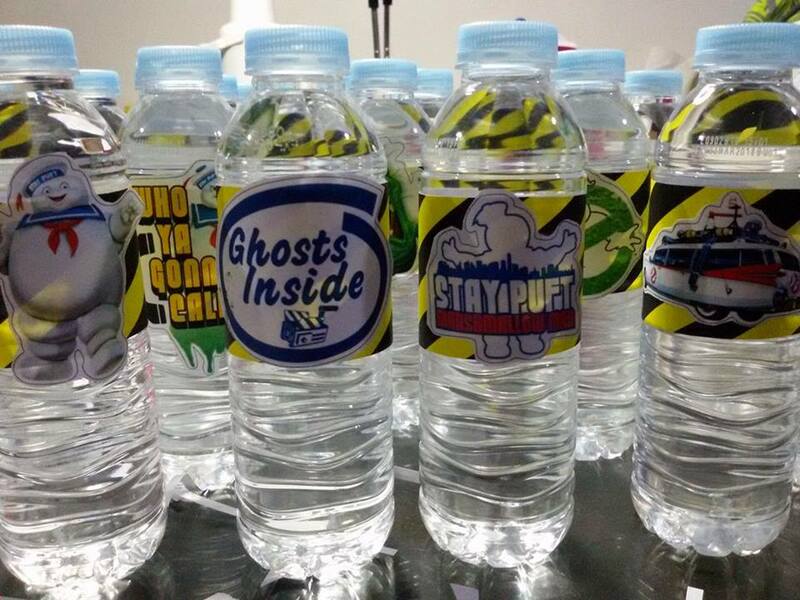 Water bottles? 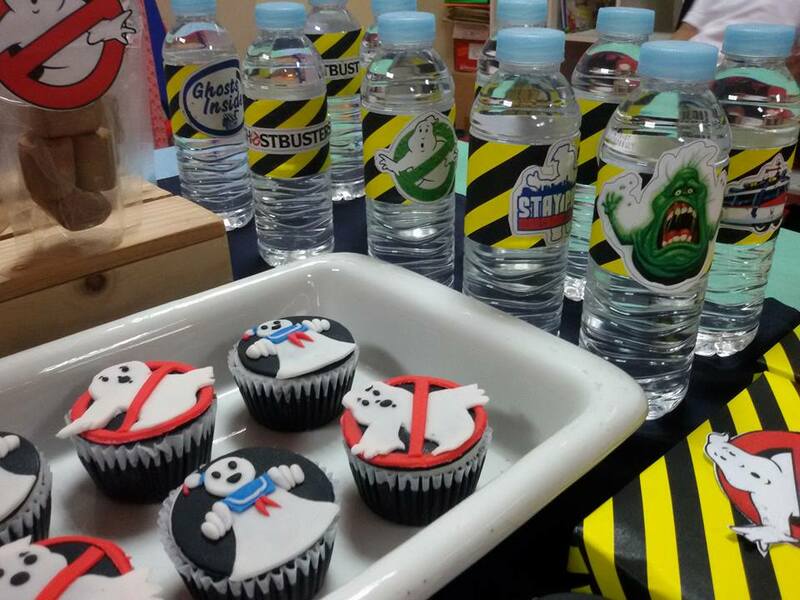 Well, I thought since super daming sweet stuff that we're giving away during his party, the kids should drink water. It's a must for my kids to drink water after eating sweets, so I came up with this idea. Plus it's easier to design it according to theme. 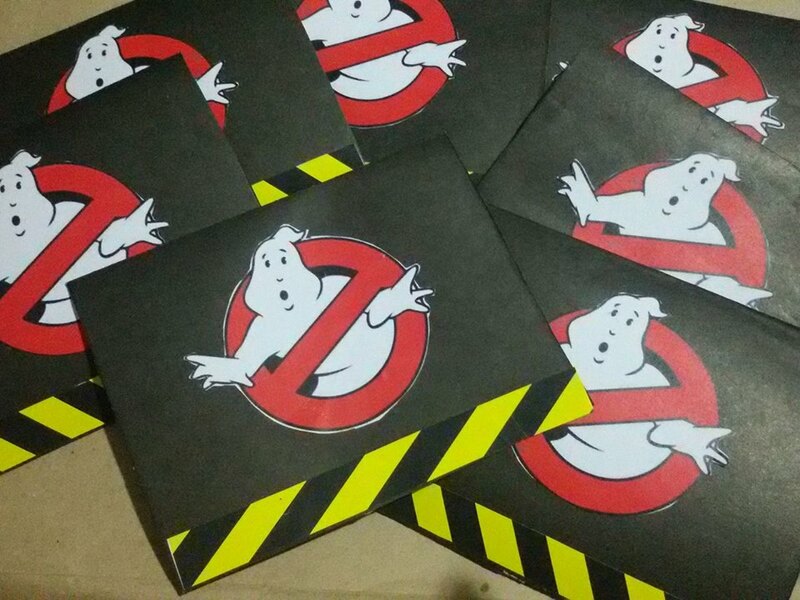 Materials used were zip locked packages, marshmallows, bond paper for the designs, scissors, and double sided tape. 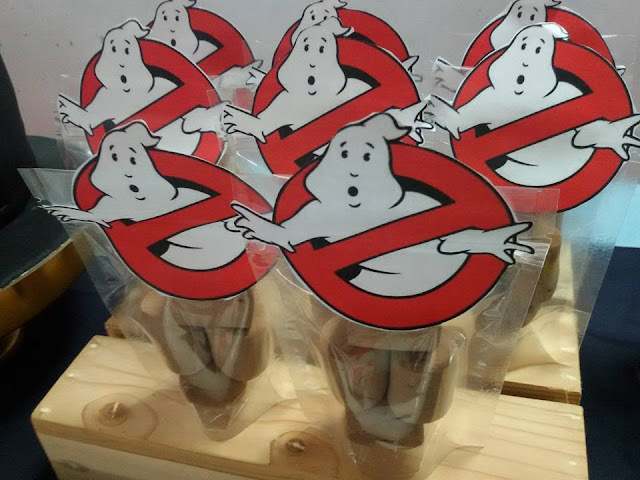 I was supposed to use a Marshmallow Man character for this, but because of lack of time to prepare and surplus of this printed Ghostbuster logo, I used this instead. 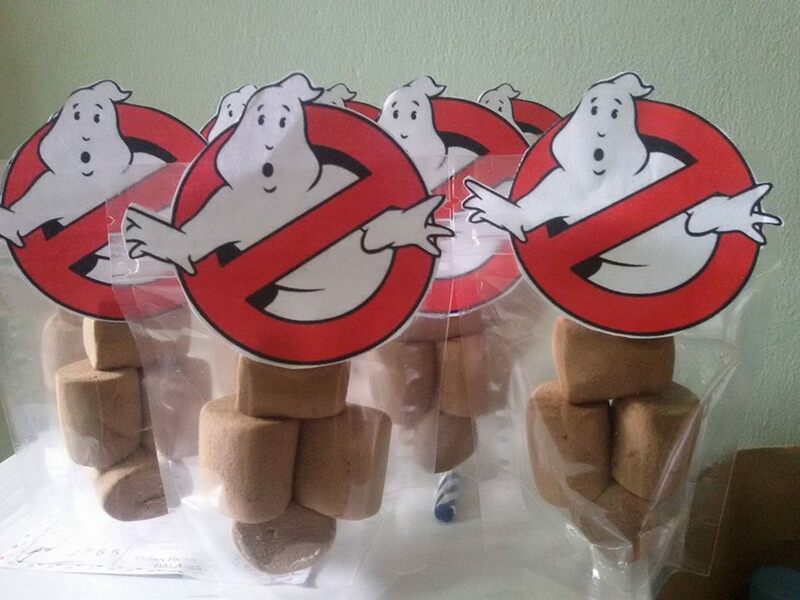 I bought large packs of marshmallows and repacked them to make a cute themed giveaway treat for the kids. When repacking, make sure you have very sanitized hands and use a thong or plastic gloves. Never touch food with bare hands. I prefer marshmallows over candies or junk food. Materials used were the prizes bought from the grocery, bond paper with printed logo and "Cautuion: pattern, scissors, and scotch tape. Prizes were food and not toys. I didn't bake this dear! I just want to show the dessert table's focal point which was of course the birthday cake! 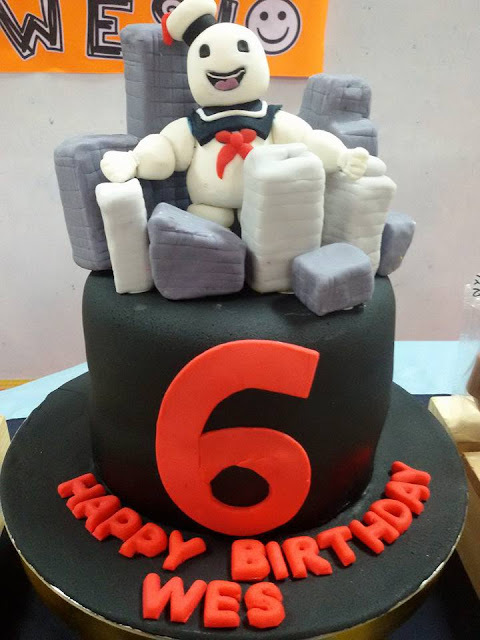 :) Wes' favorite character from the Ghostbusters is Stay Puft Marshmallow Man, so I asked my dear friend Shae of Delishaes Cakes, from whom I regularly order my cakes, to do this for Wessie. 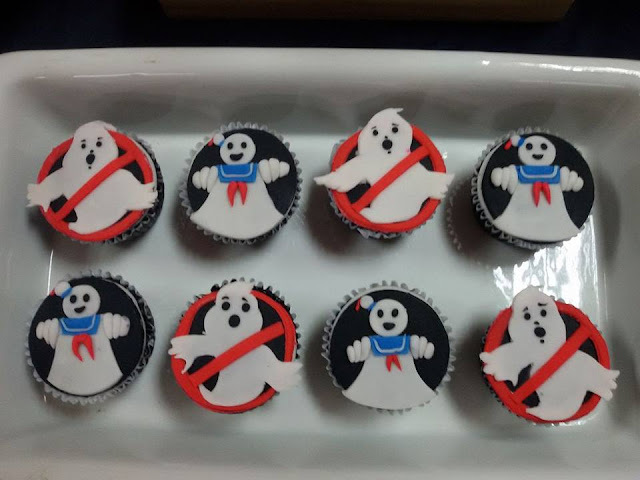 Again, I didn't bake these. I ordered it from my friend Shae Mendoza-Conducto of Delishaes Cakes (her chocolate cake and cuppies are moist and has just right level of sweetness, hindi umay!). Assembling the dessert table is pretty easy. For me there are two keys to making it visually work even if you're not a pro: Balance and Layers. It looks pretty or cool pala kasi boys yung sa akin when you lay them all on the table neatly arranged in rows. I brought some white dishes I used at home, some wooded boxes for layering, and cake stand for, of course the cake. If you have glass containers to put some more treats, you could do so. Put one or two on each corner then voila, bonggang dessert table. Make sure you have a matching table cloth (brought one for this celebration), add some buntings (which I didn't have time to make), and put a DIY backdrop with his name. You could also add DIY pompoms or paper flowers too. His teacher told me not to bring a backdrop anymore because his classmates prepared one for him. Hope you got some inspirations from this post. 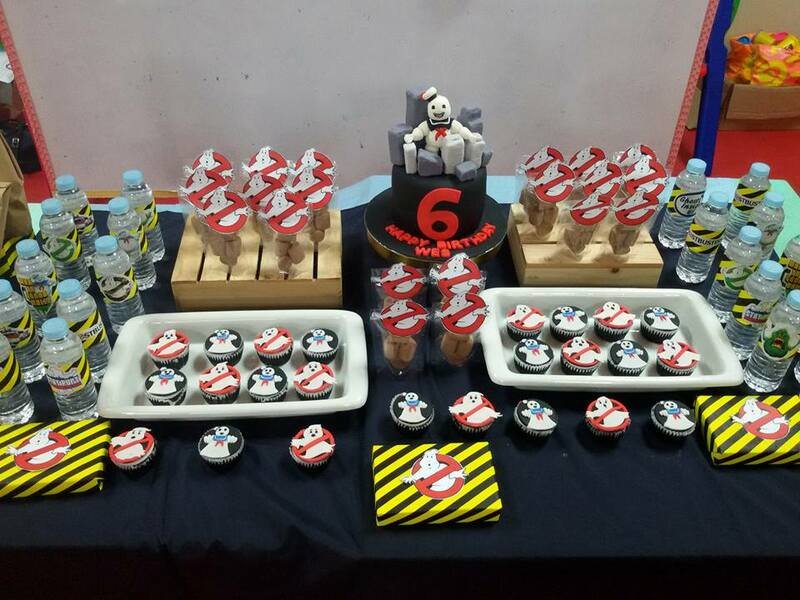 It's so fulfilling to see your DIY projects come together and make your children ecstatic about it! If I can DIY, so can you! All you need is 95% commitment and kahit 5% creativity because everything can be learned now online!